Michael Bay and Conan O'Brien's strange new scifi shows, revealed! 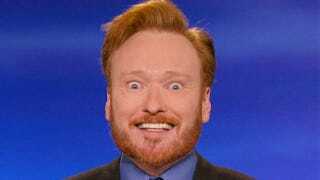 Both Michael Bay and Hollywood redhead Conan O'Brien are respectively pushing forward with some curious genre TV pitches. One sounds like a light-hearted alien affair; the other kills off half the planet in the pilot. Guess which one is Michael Bay's? Zone Lord – Conan O'Brien serves as executive producer on this sitcom with an intergalactic twist. Three roommates awake one morning to discover an evil but very hip alien has moved into their building, along with his diminutive navigator. Executive Producers: Conan O'Brien, Jeff Ross and David Kissinger. Co-Executive Producer/Writer: Ross Venokur. Production Company: Conaco LLC. Studio: Warner Horizon Television. The Last Ship – In this exciting action/adventure project based on the popular novel by William Brinkley, the crew of a naval destroyer is forced to confront the reality of a new existence when a pandemic decimates most of the earth's population. Michael Bay (Transformers) intends to direct the pilot if it is green lit. Executive Producers: Michael Bay, Brad Fuller, Andrew Form, Hank Steinberg (showrunner and writer) and Steve Kane (writer). Production Company: Platinum Dunes. Seems like The Last Ship has a better chance of actually making it to air, even if it does sound an awful lot like ABC's new drama The Last Resort (minus the end-of-the-world drama). And as long as Zone Lord is funnier than Paul, there shouldn't be a problem (and that's not terribly difficult).